Only days before Thanksgiving this year, a news story hit the wire that a 1909 T206 Honus Wagner card brought in big money at auction. That the Wagner card went for $262,900 is, of course, no surprise. Who that money went to transcended sport. A group of nuns from the School Sisters of Notre Dame in Baltimore received the profits after the brother of a now-deceased nun passed away earlier this year and left the card to the convent. Some story, sure. But have you read about The Card? The Card is, yes, another Wagner T206. From there the two cards’ paths diverge. The Card took a path far less saintly. 1. Written by a team of investigative reporters, the book makes you feel as if you are Sherlock Holmes chasing Professor Moriarty. Along the way you will get to know the unsavory auctioneers, the businessmen, and even “The Great One” gets mixed up in this story. “The Card” gets its name and hallowed status for a couple reasons, right off the top. Wagner’s card is not the scarcest printed card in history. An eBay search could confirm that. Neither is it the first trading card. Baseball cards made their debut at least as early as the 1880s. Instead, this one particular trading card achieved notoriety because it once belonged to Wayne Gretzky and because it somehow withstood 100 years and remained in near-mint to mint condition. Or did it? The value of this particular card started to skyrocket in 1985. Collector Alan Ray found himself behind in bills. No choice but to sell the card, he figured. He had no idea that his tidy $25,000 sale would fetch more than four times that price when dealer Bill Mastro unloaded it again in 1987. Up, up and away it went from there. “[The next buyer] changed everything. He created an incentive to sell these great cards. It’s not like the card ever sold for $50,000 or $75,000. It went from $25,000 to $110,000 overnight, with nothing in between,” one of The Card’s former owners said. (Card, 26-27) Financial costs were far from the lone stakes that were escalating out of control. The book reeks of betrayal, but you’ll have to follow closely to find out who got whom and how. 2. 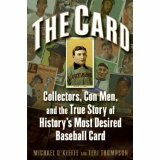 The book brings sport’s most famous card and the player whose likeness it bears to life in vivid detail. 3. In this case, it is not cliche to say there are tricks to the trade. Could The Card have been restored through devious means? “Doctoring is the biggest issue we have to deal with,” a man who evaluates the quality of cards for a living said (22). Cards can be flattened with books, trimmed with lasers or shaved with nail files or razor blades. Next time you are out to buy a nice card, better enlist a trained eye. Who would have ever guessed that cards could go from bicycle spokes to back rooms, from the cost of pennies to briefcases of cash in a few shakes?